The 1966 United States House of Representatives elections was an election for the United States House of Representatives in 1966 which occurred in the middle of President Lyndon B. Johnson's second term. As the Vietnam War continued to escalate and race riots exploded in cities across the country, Johnson's popularity had fallen, and the opposition Republican Party was able to gain a net of 47 seats from Johnson's Democratic Party, which nonetheless maintained a clear majority in the House. This was also the first election that occurred after the Voting Rights Act of 1965 became law. President Lyndon Johnson's coalition of big businessmen, trade unions, liberal intellectuals, white ethnic minorities, and blacks began to disintegrate before the 1966 election. Trade unions did not do as well as corporations during the Johnson years. Social welfare did poorly because Americans preferred reduction in taxes to social improvements. The Great Society was further weakened by reactions against urban violence (by white ethnics) and against the Vietnam War (by intellectuals and students). Republicans campaigned on law and order concerns stemming from urban riots, Johnson's conduct of the Vietnam War, and on the sluggish economy, warning of looming inflation and growing federal deficits. The losses hit the Democratic Party's liberal wing hardest, which in turn decreased Johnson's ability to push his agenda through Congress. The elections also helped the Republicans rehabilitate their image after their disastrous 1964 campaign. Alaska's at-large congressional district: four-term Democratic incumbent Ralph Julian Rivers was defeated by Republican State Senator Howard Wallace Pollock. Arizona's 3rd congressional district: sophomore Democrat George F. Senner Jr. was defeated by state legislator Sam Steiger. Arkansas's 3rd congressional district: lumber executive and Arkansas GOP chair John Paul Hammerschmidt defeated incumbent James William Trimble, becoming the first Republican member of Arkansas' congressional delegation since Reconstruction. California's 18th congressional district: onetime Olympic gold medalist Robert B. Mathias defeated seven-term Democratic incumbent Harlan Hagen. California's 25th congressional district: Charles E. Wiggins defeated incumbent Democrat Ronald B. Cameron. California's 33rd congressional district: Jerry L. Pettis defeated incumbent Kenneth W. Dyal. Texas's 7th congressional district: businessman and 1964 U.S. Senate candidate George H. W. Bush defeated Democratic challenger Frank Briscoe for the seat vacated by John V. Dowdy (whose district had been renumbered the second). Texas's 18th congressional district: Bob Price succeeded retiring Democrat Walter Edward Rogers by defeating Dee Miller. Florida redistricted to adjust for demographic changes; in addition to minor boundary changes a district was removed from northern Florida, and Broward County was broken out into its own district. Indiana redistricted for this election, and boundary changes forced two Republican incumbents into the same district while creating a new district that was won by another Republican. Maryland redistricted its at-large district into an 8th district around Montgomery County, managing to adjust boundaries so no existing incumbents were displaced. Ohio redistricted its at-large seat into a 24th district, splitting out the counties to the southwest of Dayton from the city itself, as well as moving a district in southeastern Ohio into the Columbus area. Texas redistricted for this election, eliminating its at-large district and removing two East Texas districts in favor of adding three districts in South Texas, suburban Houston, and suburban Dallas. ^ Robert Lekachman, "Death of a Slogan--The Great Society 1967." Commentary 43.1 (1967): 56+. ^ Julian E. Zelizer The fierce urgency of now: Lyndon Johnson, Congress, and the battle for the Great Society (2015) pp. 249–265. ^ Busch, Andrew E. (1999). Horses in Midstream: U.S. 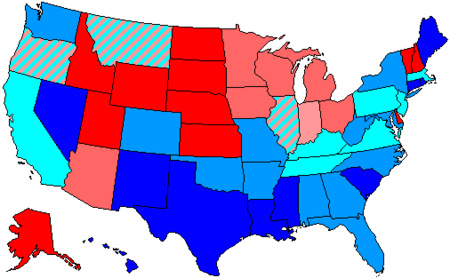 Midterm Elections and Their Consequences, 1894–1998. Pittsburgh, Pennsylvania: University of Pittsburgh Press. pp. 94–100. ISBN 0822975076. ^ Cook, Rhodes (April 29, 2010). "Midterms Past: The '66 Parallel". Sabato's Crystal Ball. Charlottesville, Virginia: University of Virginia Center for Politics. Retrieved June 20, 2017. ^ a b c d e Martis, Kenneth C. (1989). The Historical Atlas of Political Parties in the United States Congress, 1789-1989. Prentice Hall College Div. ISBN 0-02-920170-5. "a thousand points of light"
"Read my lips: no new taxes"
This page was last edited on 25 April 2019, at 01:19 (UTC).